Art. X2 – Praticar as condutas descritas nos incisos abaixo com o propósito de destruir, total ou parcialmente, um grupo, em razão de sua nacionalidade, idade, idioma, origem étnica, racial, nativa ou social, deficiência, identidade de gênero ou orientação sexual, opinião política ou religiosa. V – transferir, compulsoriamente, criança ou adolescente do grupo ao qual pertence para outro. Pena: Prisão de 20 (vinte) a 30 (trinta) anos, sem prejuízo das penas correspondentes aos tipos penais comuns. Parágrafo Único. Na mesma pena incide quem incita publicamente a prática do genocídio. X2-A - Associarem-se mais de três pessoas para a prática dos crimes mencionados neste artigo. Pena: Prisão de 10 (dez) a 15 (quinze) anos, sem prejuízo das penas correspondentes aos tipos penais comuns. 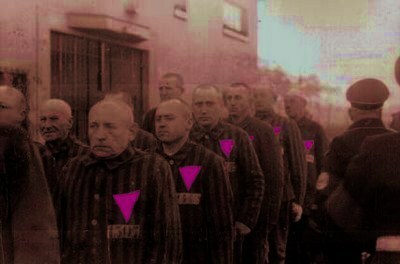 Prisoners at Sachsenhausen wearing the pink triangle. Even those not familiar with Portuguese will have no trouble seeing the resemblance to the definition in article 2 of the Genocicde Convention. What is unique about the Brazilian draft is the proposal to include ‘orientação sexual,’. Although most national legislators adopt the definition in the Genocide Convention without any change, something that confirms its virtual universality, innovation is not at all unknown and there have been many efforts to modify the definition over the years. For a full list, see the recent book by David Nersessian, Genocide and Political Groups. The Brazilian proposal is, to my knowledge, the first to include sexual orientation. In 1985, in his celebrated report on genocide to the United Nations Sub-Commission the Prevention of Discrimination and the Protection of Minorities, Benjamin Whitaker mooted the idea of amending the definition to include homosexuality. Genocide rears its head as a campaign issue in the United States elections once again. In September 2004, George Bush and Colin Powell launched the charge that the Sudanese government was committing genocide. It was a demagogic appeal aimed at obtaining votes from American fundamentalists. Some months later, a United Nations Commission of Inquiry ruled that the word genocide was not an appropriate description of the atrocities that had taken place in Sudan. This time around, it is Mitt Romney trying the same trick. 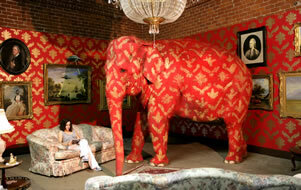 Yesterday, in New Hampshire, he made a statement concerning Iranian President Ahmadinejad. ‘What Ahmadinejad said this past week about Israel ... the awful, offensive, obnoxious things he said should lead to him being indicted under the Genocide Convention [and] his people being treated like the pariah they are’, Romney said. Romney was referring to one of Ahmadinejad’s periodic outbursts, in which the Iranian president apparently said that the State of Israel was a ‘cancerous tumour’ that should be ‘destroyed’. Nobody is claiming that Ahmadinejad or Iran have actually committed genocide. There is a Jewish minority in Iran, represented in Parliament, that is probably better off than Jewish communities in many countries of the Middle East. Romney was building on a campaign that has been going on for several years now aimed at charging Iran, and its President, with ‘direct and public incitement to commit genocide’. This is a distinct crime from genocide as such, and exists even if genocide itself is not committed. It is committed by words alone. When the United States incorporated the crime of genocide into federal legislation, in 1988, it provided that direct and public incitement to genocide was subject to a fine of not more than $500,000 or imprisonment for a maximum of five years. On the Richter scale of crime in the United States, it is hardly a tremor. Inevitably, the crime of direct and public incitement involves interpreting words that are susceptible of more than one meaning. The Rwanda Tribunal has convicted people for incitement, but the challenge of interpreting the meaning of specific comments prior to and during the Rwandan genocide is simplified enormously by the fact that genocide actually took place. Similarly, we understand that Nazi talk about a ‘final solution’ meant genocide, but that is because of the deeds that followed the words. In the case of Ahmadinejad, what are the deeds that help us construe the words? His attackers point to Iran’s alleged efforts to obtain nuclear weapons. Indeed, in yesterday’s speech Romney made the link. It is argued that Iran wants to get nuclear weapons in order to destroy Israel and thereby fulfill its genocidal ambitions. The purported genocidal association between Ahmadinejad’s words and Iran’s nuclear plans is pretty thin. Isn’t it far more plausible that Iran wants nuclear weapons as protection, and deterrence, given that its major strategic and military threats in the region actually have nuclear weapons? Of course Romney’s charges are also part of his well-known declarations of support for Israel’s threatened military attack on Iran. In that context, the genocide charges look like nothing more than sabre rattling for aggression by Israel. On his recent trip to Israel, Romney endorsed an Israeli military attack on Iran. He also made his bizarre statement about how Jewish culture accounts for Israel’s prosperity, something that many took as an insult to Palestinians and Arabs. I thought the suggestion that Jews are good with money also sounded like old-time anti-Semitism, but his Zionist cheerleaders seem prepared to overlook the point. What to make of Ahmadinejad’s remarks? The most plausible interpretation is that he posits the destruction of the State of Israel. But that is not at all the same thing as the extermination of the State’s inhabitants. Anyway, the speculative hypothesis of an Iranian nuclear attack aimed at destroying Israel would also kill millions of Palestinians and other Arabs. This hardly makes sense, even for a reckless tyrant like Ahmadinejad. In Ireland there are many who would like to ‘destroy’ the state of Northern Ireland. They don’t mean exterminating its inhabitants. During the Cold War, there were those who called for the destruction of the Soviet Union, and of Yugoslavia. They were successful, by the way. But obviously that did not mean extermination of the populations of those states. Are those who call for a ‘one-state solution’ - that is, a secular democratic state that may at some point in the near future have a Palestinian majority – endorsing the destruction of Israel? Certainly it would be the end of Israel as we know it. Ahmadinejad’s comments may lend themselves to varying interpretations, but when read in context they cannot be viewed as incitement to genocide. Confronting the threat of genocide is one of the existential problems of our time. But beware of those who brandish the word cavalierly, especially if they are trying to build support for an illegal military attack on a foreign country, or to stifle political discussion about the future of Israel, or campaigning for the United States Presidency on behalf of the Republican Party. The Inter-American Commission on Human Rights recently released a nearly 200-page report on capital punishment, with a focus on its own case law and that of the Inter-American Court of Human Rights. It is entitled The Death Penalty in the Inter-American Human Rights System: From Restrictions to Abolition. This is a very thorough review of the applicable law that demonstrates the important role the Inter-American institutions have played in its development. If a criticism of this otherwise excellent report may be permitted, there is an obvious truth about capital punishment in the western hemisphere that does not emerge: the death penalty has virtually disappeared, with one, single exception. Over the past decade, several hundred executions have taken place within the United States, while a handful have been conducted elsewhere in the hemisphere. There was one execution in St Kitts and Nevis in 2008, and three in Cuba in 2003. Aside from the United States, that’s it. Several states in the Caribbean continue to sentence people to death. But executions are not carried out. Much of the responsibility for this is due to the energetic work of lawyers in the region, and in England, who have launched effective judicial attacks. Cuba now appears to have abandoned the death penalty. The most important observation that can be made about the death penalty in the Inter-American human rights system is that it has disappeared, for all intents and purposes, with this one terrible exception. The Inter-American human rights system deserves much of the credit for this development. In order to progress the idea of abolition in the United States, it is essential that we continue to remind Americans of how isolated they really are. It is also important to point out that the disappearance of capital punishment on a regional level is not just a European phenomenon (with one exception - Belarus). The death penalty has also virtually disappeared in the western hemisphere (with one exception - the United States) and in Africa (with a few exceptions). 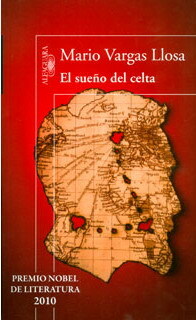 The latest book by the Peruvian writer Mario Vargas Llosa, El sueño del celta (The Dream of the Celt), describes some of the earliest human rights investigations of modern times. It is a somewhat fictionalised account of the life of Sir Roger Casement, an Irishman who worked for the British diplomatic service. The book is built around three main themes, two of which are human rights fact-finding investigations conducted by Casement around the beginning of the twentieth century. Casement was assigned by London to inquire into human rights abuses in the Congo Free State, then the person fiefdom of King Leopold II of Belgium. Casement was not the first to expose the terrible abuses but his authoritative report had extraordinary influence. No doubt influenced by Casement’s findings, Mark Twain published his own satirical book, King Leopold’s Soliloquy. Following publication of the report, Casement developed an international reputation as a human rights investigator. Much of this account by Vargas Llosa, who was awarded the Nobel Prize for Literature in 2010, is an account of the human rights abuses in the Congo. Vargas Llosa makes a sharp contrast between Casement’s approach with that of Joseph Conrad, who expressed the view, in Heart of Darkness, that backward Africa had brought out the primitive instincts of Europeans. Casement’s second major investigation concerned the activities of the London-based Peruvian Amazon Company in the Putumayo region of Peru. Casement exposed the brutal practices which were related to harvesting rubber, and of which the victims were indigenous peoples. Again, Vargas Llosa describes the abuses in great detail. One feature that will be of particular interest to modern-day human rights scholars is the focus on corporate social liability for human rights abuses. The horrific activities of the Peruvian Amazon Company were quietly tolerated by the Peruvian government. But Casement’s conclusions were directed at London, where the company had its headquarters and took its profits. The third theme of the book is Casement’s conversion to Irish nationalism. Vargas Llosa presents this as the logical progression of the views that emerged from his work in the Congo and Amazonia, and which made Casement ‘one of the great anti-colonial fighters and defenders of human rights and indigenous cultures of his time’. 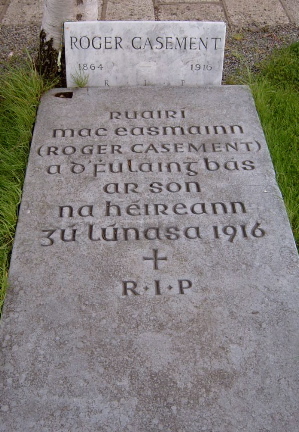 The author explains how Casement began his career driven by a mission to bring modern civilization to Africa and elsewhere, but through his human rights investigations came to understand that the abuses he encountered were not unfortunate distortions of the colonial project but rather their inevitable consequences, built as they were upon ideas of racial and cultural superiority. From there, it was a small step for Casement to become, in his final years, a campaigner for Irish independence. When the First World War broke out, Casement went to Berlin to enlist German support in the struggle for Irish independence. He was captured by the British upon his return to Ireland, in 1916, and executed in London’s Pentonville Prison on 3 August of that year. In keeping with British prison practice, his remains were buried within the prison walls. In the 1960s, Prime Minister Wilson allowed them to be moved to Ireland, although on the condition they not be taken to Northern Ireland. They were buried in Dublin’s Glasnevin cemetery following a State funeral addressed by the President. Vargas Llosa also deals with Casement’s homosexuality. After his arrest in 1916, the British worked to undermine any sympathy that Casement might attract by disseminating copies of Casement’s so-called ‘black diaries’, which recounted Casement’s propensity for casual sexual encounters with young men, some of them in their teens. Vargas Llosa presents this material with considerable sympathy. He accepts the validity of the controversial diaries, which many have claimed were forged, but takes the view that much of them reflect Casement’s fantasies rather than actual activity. Authored by one of the great writers of our time, The Dream of the Celt, which appeared in English translation a few months ago, belongs on the bookshelf of human rights investigators, campaigners and scholars.